You may think that the end of the summer is a strange time of year to be discussing hanging baskets. But winter bedding brings colour and a little joy into everyone’s life at a grey time of year, and you will see a hanging basket, often right outside the door, in a way that you may not see containers in the garden! So what do you need to know and do to plant up a hanging basket to see you through winter and spring? Wicker ones are often sold and are quite pretty in themselves. You might also try a metal frame, lined with moss or hanging basket liner, through which you can push trailing plants and grow them all around the basket, not just in the top. Line the basket with your liner, and also a piece of polythene, such as an old carrier bag, with holes cut in it. This will improve water retention, but not make the basket waterlogged. Multipurpose compost is fine for hanging baskets, although a loam-based compost (such as John Innes) will not dry out as quickly. You can buy compost from compost suppliers, both in small quantities and in bulk. Add a slow release plant fertiliser and, if you like, some water-retaining crystals, mixed thoroughly into the compost. Suitable plants for winter hanging baskets include pansies, violas, thymes, ivies, little cyclamen, and primroses. You can also under-plant with bulbs such as Daffodil ‘Tete-a-Tete’, crocus or dwarf irises. 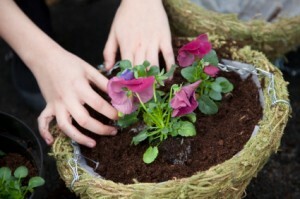 Make sure you include some trailing plants to spill over the edges of the basket, or to grow from the sides. The evergreen thymes and ivies provide colour all winter, even when the violas and pansies are struggling with the cold, and then the spring flowers burst out as soon as the sun comes out. Don’t try to cram too much into your hanging basket, as the plants will need some soil to grow in! Four or five plants in the top of a wicker basket is plenty, together with five to ten bulbs underneath. Any more, and your plants will suffer. If you have a larger basket, then of course you can include more plants. Even in winter, you may need to water a hanging basket, particularly if it is in the shelter of a porch, or perhaps a climber around the door. You probably won’t need to water every day, but at least once a week would be good. Don’t forget to remove dead flowerheads to encourage prolonged flowering, too, and with a bit of care and attention, your winter hanging basket could keep going well into next summer.